Who says a smart salad has to be mostly lettuce—and cold? 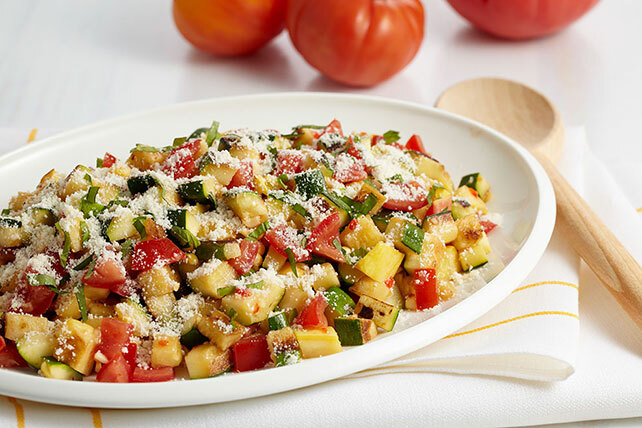 Heat things up with veggies warm from the grill and the bold flavors of garlic, lemon juice and Parm. Grill corn 15 min. or until kernels are tender and browned, turning occasionally; cool slightly. Meanwhile, grill squash and zucchini 5 min. or until tender, turning occasionally. Cut kernels off cobs; place in medium bowl. Chop squash and zucchini. Add to corn with tomatoes; mix lightly. Mix dressing, lemon juice and garlic. Add to vegetable mixture; mix lightly. Top with cheese and basil. Add 6 slices crumbled cooked OSCAR MAYER Bacon to corn kernels with the dressing and remaining ingredients. Use leftover salad as a filling for tacos.